This watermelon popsicle recipe is juicy, sweet, and easy to make. The chocolate dipped coating is optional, but recommended! Ohhhhhhh – kayyyyy. Hi, there. Things have been CRAZY around here since I posted those BOMB cauliflower tacos, dudes. We had several unexpected, last-minute recipe development gigs that were due ASAP. AND we rented a second camera over Memorial Day weekend to shoot seven – yes, seven – recipe videos in 2 1/2 days. Somewhere in the midst of all this madness, I managed to order some popsicle molds from my very, very good friend Amazon Prime for this recipe (and for multiple summer popsicle recipes that are coming soon). The idea for these watermelon popsicles has been burning a hole in the creative side of my brain for weeks now. It’s been torture, I tell you, torture. It all started out simple enough. 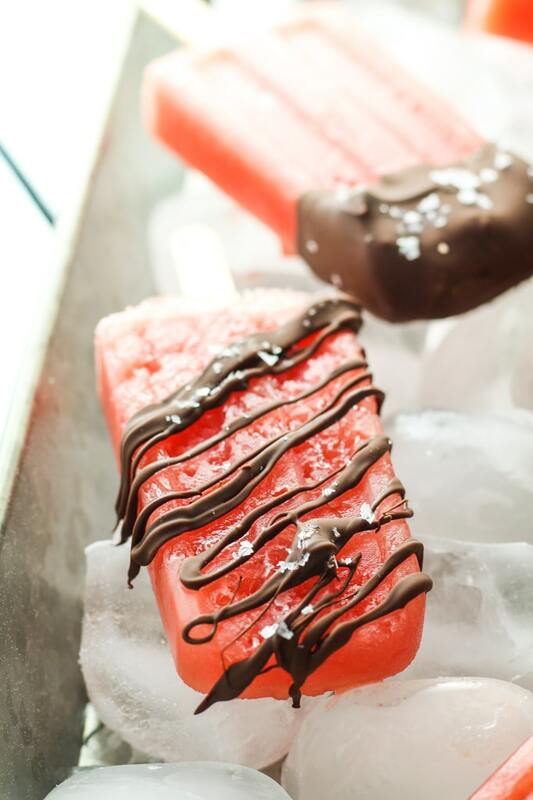 Watermelon lime popsicles. YUM, right? But wait. 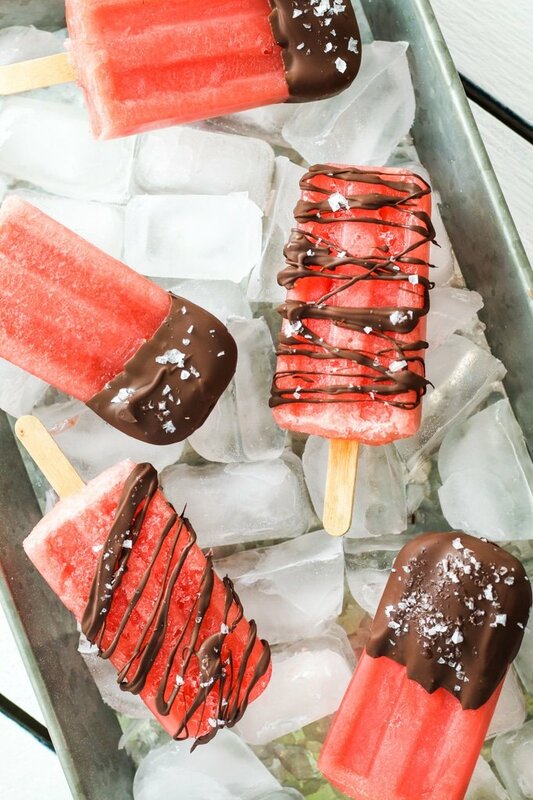 What if I dipped the popsicles in chocolate for a crunchy and sweet bonus? In that case, I don’t need lime. But it’s watermelon and people love salted watermelon. 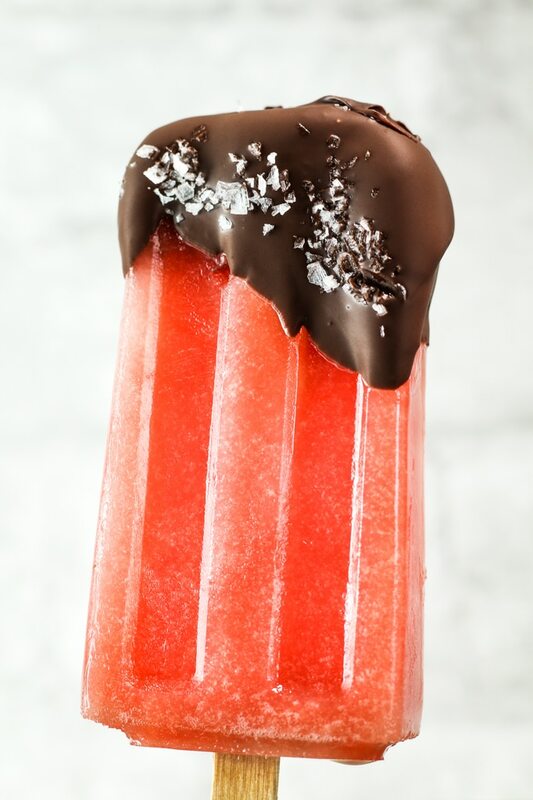 WHAT IF……… SALTED CHOCOLATE WATERMELON POPSICLES. Alright, now you know how my off-the-wall creative process works. It’s weird up there, y’all. And generally speaking, that’s how recipe brainstorming works. It starts with a nugget of an idea or an ingredient that I love, and next thing I know, I’m posting zucchini noodles with kimchi or turning sweet potatoes into dessert. I don’t understand it, but I’m not complaining because it works. Ain’t broke, don’t fix it. As long as my brain keeps kicking out ideas like watermelon popsicles, dipped in chocolate and dusted in salt, I’m gonna be a happy camper. Which reminds me – we’re FINALLY going camping this weekend! We couldn’t get out last weekend (see above) which turned out to be a blessing because the weather was temperamental in the mountains. But this weekend, we are ready for some rest and relaxation. I might even see if I can finish A Clash of Kings (Game of Thrones nerds, where you at?). I hope that YOU make these popsicles this weekend! And I really hope that if you do, you tell me all about it and show me your stuff on Insta. Puree watermelon and honey together in a blender until smooth. Pour into popsicle molds and freeze overnight, or at least 6 hours. 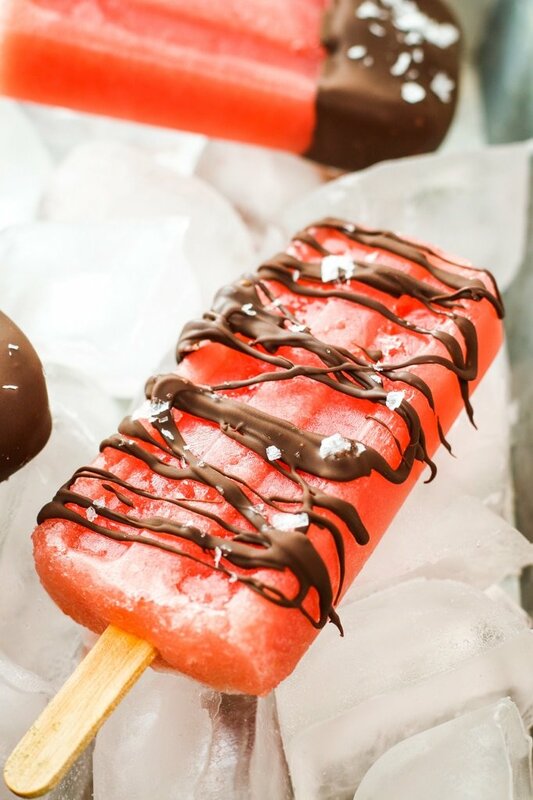 Remove popsicles and quickly dip in the chocolate. 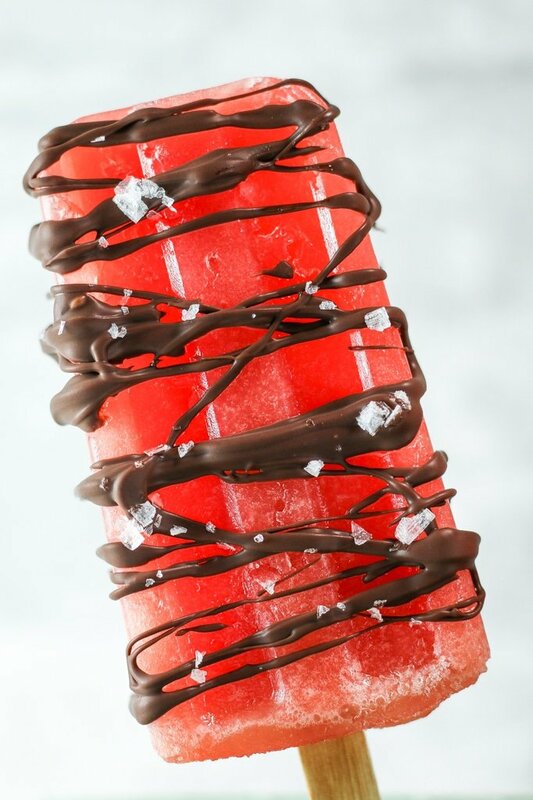 Or drizzle chocolate over popsicles! Sprinkle with sea salt. Enjoy! Or – return to freezer for later enjoyment! C’ est merveilleux! je suis une passionnée de la cuisine et j’ aimerais vraiment être instruite auprès de vous. What is this magnificence?! I never thought about doing this, but it’s a perfect post run treat! These look so refreshing and delicious! What a great idea! I am so intrigued by this flavor combination. 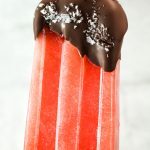 I’ve never had watermelon and chocolate together, let alone salted watermelon! I am a huge watermelon fan, too! I don’t know what I ever did before Prime lol. What a perfect sweet and salty summer treat! Need to give these a try! This looks like a very yummy concoction indeed! I love how the creative process works!